Stunning, size 8 Jack Sullivan wedding gown. Too pretty to sit a wardrobe for the next 20 years! This dress is for the bride that wants to turn heads and experience the full ‘Princess’ feeling on her big day! The bodice is hand beaded with intricate pearl beading and french lace detail, with full structured bodice. It has a striking V neckline with built in bust cups and full skirt with scalloped lace edging over the tulle. The french lace details adds a romatic touch and a deep V back add a subtle sexiness to this very classic style dress. Purchased from ‘brides desire’ in Brisbane city. 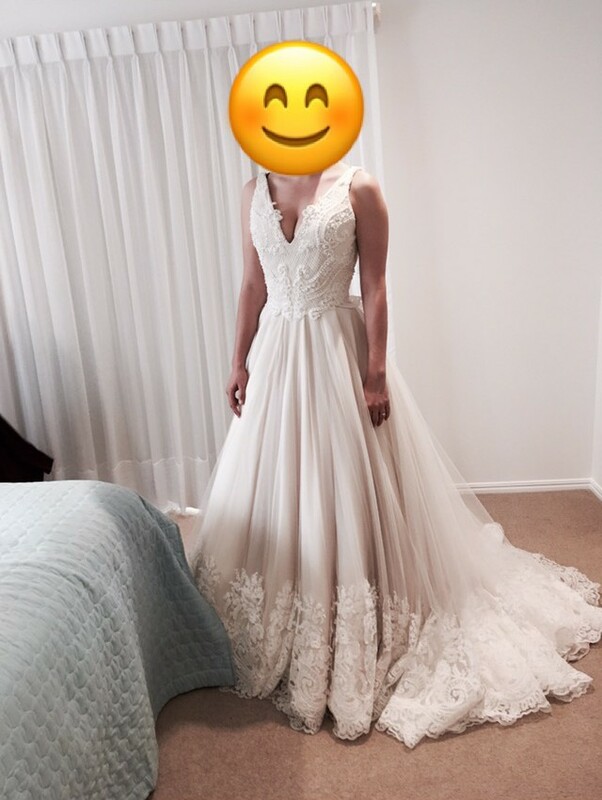 I adored wearing this dress and hope someone else can experience the same princess feeling it gave me on their big day. Although I had a second, more casual dress for the reception, I opted to stay in my gown as it was simply too beautiful! Height: I am 165cm and wore large heels on the day.